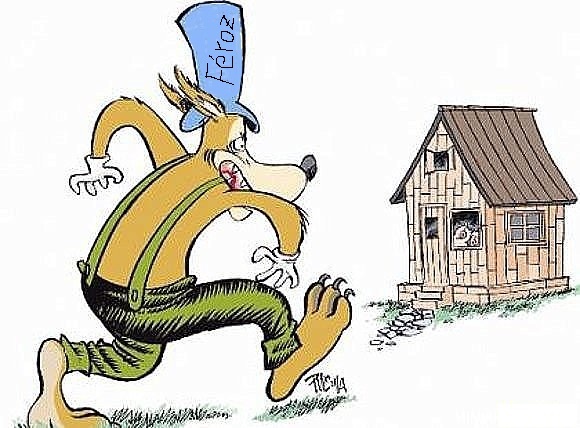 Little Green Riding Hood, is a green area¹ that was peacefully materialized on a urban land and through which ran (and still runs a high-voltage overhead line)… About the big bad Wolf we’ll talk later . Illustrative map of the location of the plot. In 1998 it is updated, in the deeds, the construction (existing house) and the sale of the plot. In that deed of purchase and sale there is not any update related to the phisical defintion of the plot. the current owner (since 1998) sells the plot in 2005, but this time there is an statement declared in the deeds that the estate is not 1.020 m2 but 1.633 m2, all regarding a “descriptive and graphic certificate issued by the cadastre”. 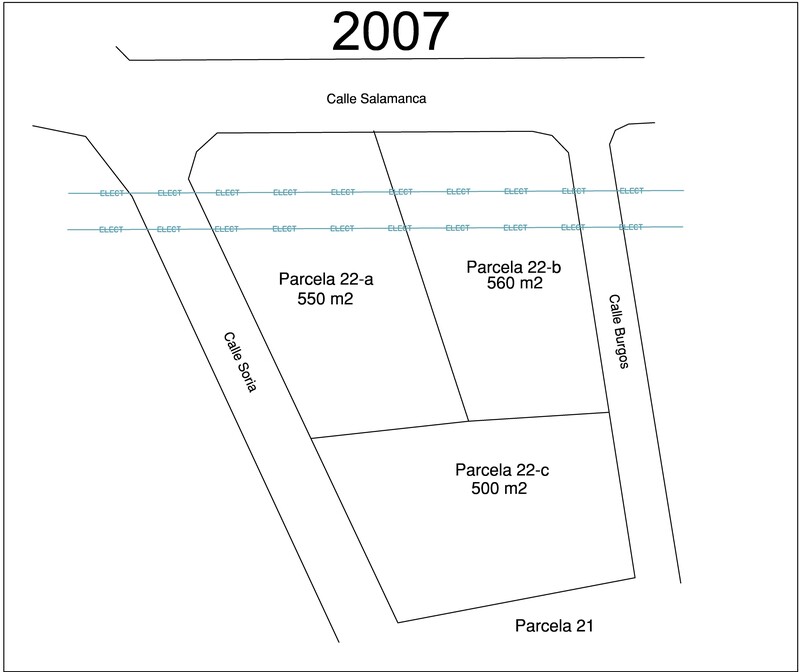 In 2007, the owner (since 2005) proceeds to register the correction of the measurements described in the previous title, where said according to cadastre 1,633 m2, arguing that the real measurement of the plot is 1,610 m2. Urban-plot house built above the plot number twenty-two, included in the main lot located at the Municipality of “The enchanted forest”, parish of the “take it and run”, described in the previous inscriptions, saying in the title now presented that this plot according to recent surveying² has a real area of one thousand six hundred ten square meters, in whose terms it is rectified, in accordance with the provisions of article 298 of the mortgage regulation, paragraph 3, fourth subparagraph, updating the boundaries, so its currently borders are: to the North by Calle Salamanca; to the East Burgos Street; to the South with plot 21; and to the West with Soria street, end this last which is justified with descriptive and graphic, cadastral certificate issued by the cadastre which photocopying joins the writing that I sign up. The overhead high-voltage line still being in place, but this time through two urban plots. There is nowadays a house on each of those 3 urban plots. Municipal land planning, in 1998 and 2005, did not establish any green area on that land. This green area consisted in the original titles because it came from an older Development Planning that served to register the plots. But that green area was not provided to the public nor private ownership as it should have been, although it was still “occupied” by the high-voltage overhead line that was its original purpose. Municipal Land Planning sets 500 m2 as minimum buildable plot, for that zone. In one hand the article 205 of the Mortgage law. In addition to this, the article 298 of the mortgage regulation and article 53 of the law 13/1996 of 30 December, fiscal measures, administrative and social order . Decree of 8 February 1946, which approves the new official version of the mortgage law. It will be registered, without prior registration, the Government securities issued by those who prove so reliable purchasing law prior to the date of such securities, provided that the same right in favour of another person has not been registered and published edicts on the Bulletin Board of the town hall where lies the estate, issued by the Registrar with a view of the documents submitted. In the seat that is practiced are necessarily expressed the circumstances essential acquisition above, taking them from the documents themselves or others submitted to the effect. Decree of 14 February 1947, which approves the mortgage regulation. 3. In addition, may be registered the excesses of area of registered legal plots, resulting from securities of acquisition, provided that proving as provided in paragraph 1 the prior acquisition of the property by the transferor with the resulting greater capacity, expressed the cadastral reference and be incorporated or accompany certification cadastral, descriptive and graphicallowing perfect identification of the property and its excess space and that is that the estate is registered in favour of the registered proprietor or of the purchaser. In the same way may register the excesses of accommodate accredited by cadastral certification or, when they were less than fifth of the registered area, with the certificate or report of a qualified technician, in the terms provided in article 53 of the Act of 30 December 1996, allowing perfect identification of the estate and its excess capacity, without the need for translational title. Law 13/1996 of 30 December, fiscal measures, administrative and social order. Two. 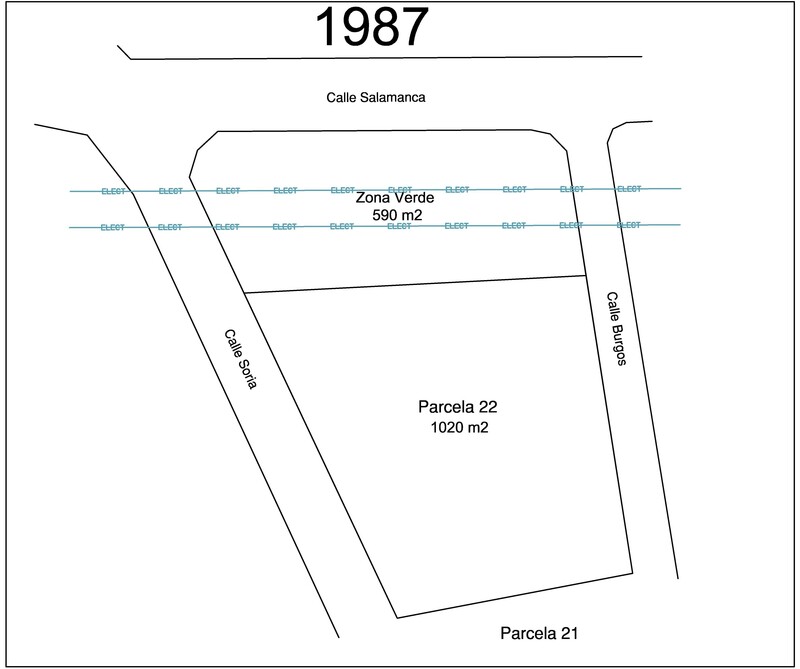 When the situation, denomination and surface of the property described in the title does not correspond with the respective cadastral document provided descriptive data, or when it does not reflect the data or do so in terms which do not allow to appreciate the identity between the cadastral plot and the legal plot that the individuals described in the title, can only reflected the cadastral reference invoked by the licensors if the document meets the requirements according to article 205 of the mortgage law and its rules of procedure 298 would register the leagal plot. In any case, shall be published edicts prevented in those articles, in which is expressed that the registry property described is credited the cadastral reference outlined in the document. The registry entry of the cadastral reference will not produce effects against third parties during the two years following the date of the respective seat. Esta entrada fue publicada en Internacional y etiquetada Cadastre, Civil Law, english, International, Land Registry, legal, Municipality, Notaries, Surveyor. Guarda el enlace permanente.